Legendary British band The Stranglers have today presented a 400-year-old local pub in Surrey, the Star Inn, with the prestigious PRS for Music Heritage Award. The accolade is given to those live music venues across the UK that have played a crucial role in helping to create music history, by giving now-famous acts their first ever gig and helping them on their way to success. Originally from Guildford, The Stranglers first performed at their local hometown pub, the Star Inn, on 21 December 1974, just three months after forming (initially as The Guildford Stranglers), in September that same year. This early act of generosity marked a turning point for the band which would see them become vital instigators of the UK punk rock movement, and release 23 Top 40 singles, 18 Top 40 albums, and a slew of now-iconic hits including Golden Brown, Peaches, No More Heroes, and Hanging Around, in the years that followed. A lucky opportunity to play at their local music venue, saw the band attract a dedicated following from the very start, cementing a special relationship between band and venue. PRS for Music, which protects the rights of more than 135,000 songwriters and composers, ensures music creators are represented whenever their music is used or performed in public. The organisation established the PRS for Music Heritage Award in 2009 to celebrate the important role that music venues play in supporting songwriters at the start of their careers, giving them a platform to perform in front of a live audience for the very first time. Grassroot music venues like the Star Inn provide a crucial environment for new and emerging acts to harness and develop their talent, try out new songs, experiment with creative identity, and build the foundations for a long-lasting fan base. These venues have witnessed the birth of some of the nation’s most loved music legends. Previous PRS for Music Heritage Awards have been given to venues that have helped the likes of Queen, Madness, Pulp, Spandau Ballet, UB40, Status Quo, Soul II Soul, Sir Elton John CBE, Blur and many more at the start of their musical careers. 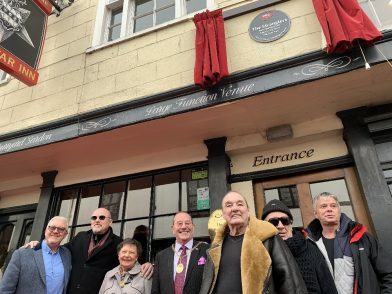 This year’s PRS for Music Heritage Award plaque was unveiled by The Stranglers at a special red carpet ceremony today at the Star Inn, Guildford. The unveiling of the plaque sees the start of what’s sure to be a hectic year for the revitalised band as they embark on their upcoming UK tour, Back on the Tracks, spanning 19 dates, 28 February – 30 March 2019.